When asked that inevitable question at the Thanksgiving table every year, “what are you thankful for?” I always freeze. What’s the one perfect answer? What if I answer incorrectly? So. Much. Pressure. Family? True, of course, but corny. Food and this well-deserved glass of wine? Both obvious and a bit shallow. The truth is there is NO WAY I could come up with just one answer. I am blessed and thankful not for one meal, one person, or one moment, but because of the many moments that make up a blessed life. And shouldn’t we all be grateful for the bigs and the smalls? What we have, and often, what we don’t have? This gratitude banner is my way of avoiding that awkward moment at the Thanksgiving table and of encouraging my family to be grateful at their leisure - often and honestly. Start by cutting your fabric with pinking shears to approximately 8"x10". If you want to get really kooky cut the bottom corners like I did. 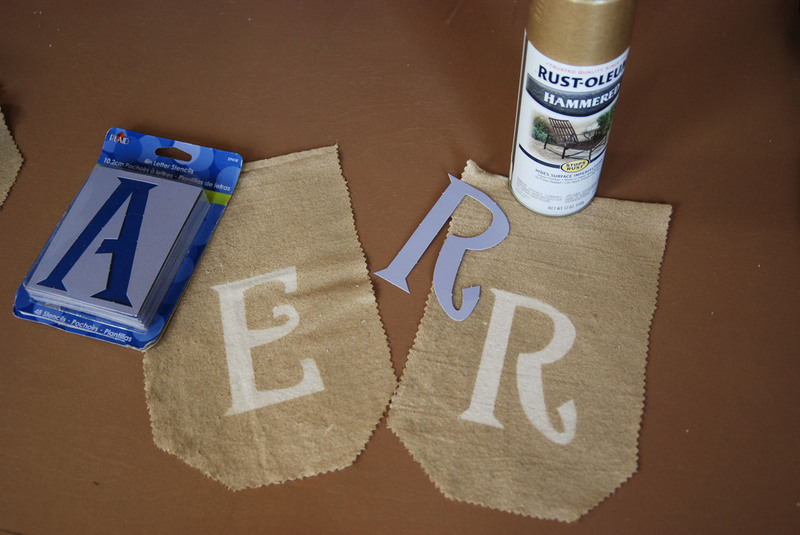 Place letter stencils 2" from bottom and centered on fabric and spray with paint. Fold over top of rope or thick twine and hot glue. Your simple banner is made, but we're not done yet! I found a 6x6 pad of scrapbook paper with patterns I liked, and cut tags to size for a pop of color . I also mixed in some plain postal tags for variety. Add some string, yarn or twine (cut to 10") to your tags and invite family and friends to share the things they're thankful for.... no pressure!